"They did what to my precious Pokémon Blue/Red/Yellow?!?" I was not amused with the news that Nintendo's glorious high-definition remaster of the game of my childhood was using the same gimmicky and dull monster catching minigame of Pokémon Go on mobile. Pokémon Blue is a precious memory to me. A game that I had quite literally played through a dozen times as a child (I know because I kept replaying it to get more Farfetch'd, which you could only get one of per play through, and I had ended up with 12), and the idea of stripping the random battles out of it was a big mental wall for me to try and push through. I'm glad I did, though. Pokémon: Let's Go turns out to be a slickly streamlined Pokémon experience that attempts to make the increasingly convoluted gameplay mechanics of the "main" series simple and accessible again, as they were in that first title on the Game Boy all those years ago. I still can't stand that poké ball-throwing minigame to catch the pokémon, but in every other way, this is a real delight and love letter to what made people fall in love with Pokémon in the first place. I'm going to address the one irritation I have with Let's Go first, though, because it really made the first couple of hours unpleasant. 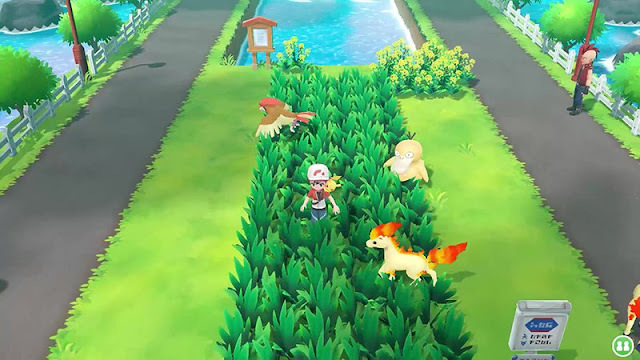 In the typical Pokémon title you catch the little critters by running around in fields of grass, before one pops up and forces you into a random battle. There, you need to weaken it enough that a Poké Ball can be tossed at it to "catch" it. If it wasn't weak enough, it would escape the catch attempt, but with a bit of skill and experience, you'd generally not have too much trouble catching yourself some new beasties. Enough people have played Pokémon by now that this system would have to be pretty familiar to most people by now, I would think. Pokémon Go (the mobile title that was an worldwide mega-phenomenon a few years ago), meanwhile, removed that combat element. Instead, you would throw a pokémon a berry or two to pacify it, and then throw a Poké Ball at it. Time the throw right, and you've got a better chance of catching it. Most likely, however, you'll need to throw a fair few balls before you'll finally get one to stick. It works well enough for what it is, but it's a system that I've never felt understood the appeal of pokémon catching. In a proper Pokémon game, catching a new monster was a commitment. You'd need to figure out ways to weaken it properly, and then risk what was a pretty limited resource (poké balls didn't necessarily come cheaply) to catch it. 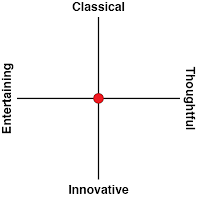 It was also a time commitment, as you'd need to approach battles carefully and with precision. As a result, however, as soon as you successfully caught a pokémon, you felt a greater sense of satisfaction and ownership in adding it to your collection. Poké Balls in Pokémon Go are so easy to come by that you can just throw them with abandon, and catching a Pokémon is a completely unengaging process of luck and timing. In most cases, it's over quickly, too. For want of a better word, this commodifies the Pokémon, and I never had the same sense of satisfaction in catching them. Particularly when I was encouraged to also constantly get rid of unused and unwanted ones. 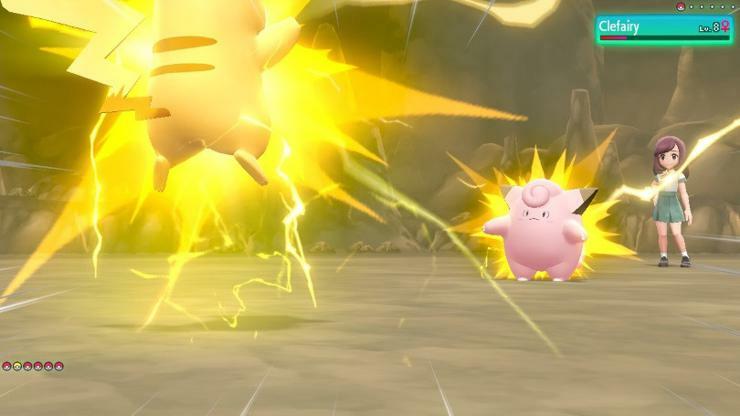 Thankfully, Pokémon: Let's Go retains the combat system of traditional Pokémon when fighting against other NPC trainers that dot the landscape. Because the pokémon develop in the same was as a more traditional Pokémon title, once I got through the first couple of hours and those trainer battles became more frequent, and I started challenging the gyms, I was able to forget about the simplified catching, and enjoy using my favourite monsters all over again. This is also partly because Pokémon: Let's Go is so utterly gorgeous. Pokémon has always been an exercise in graphical restraint, but this Nintendo Switch title is quite indulgent, with beautifully rendered critters that have a great deal of personality and detail in their moves, attacks, and reactions. 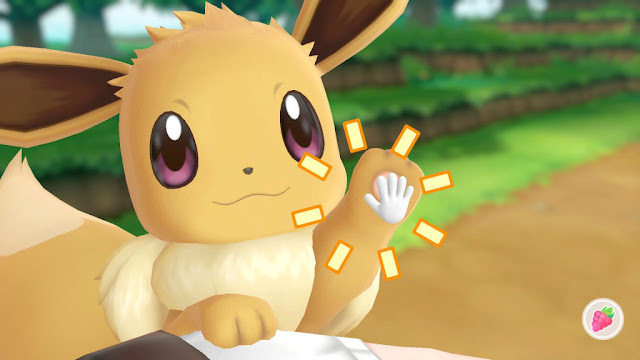 Whichever character is named on the version you purchase (in my case, Eevee) accompanies you on your journey and you can have the most adorable interactions with it, while you can also pull one other pokémon out from your collection to also wander around with you. And it's just so darn charming to have a Psyduck waddling along behind you. As someone that spent so much time simply imagining what the Pokémon Blue monsters would look like, because back on the Game Boy they were a mess of unanimated pixels that barely looked like anything, and really did demand a player engage their imagination, in some ways it feels like Pokémon Let's Go has come full circle in realising what I had always seen in my imagination on screen. The further I drove into Let's Go, the more I started to appreciate the decision to remove random battles. Because I could blast through a patch of grass and capture the three or so different monsters that could be found there in a few minutes, I found that the game itself flows better from start to finish. There's no more getting stuck in a long grind to make your way through a cave, for example, and you don't need to battle the same random, common monsters over and over again, hoping for a more rare one to pop out later. Pokémon Let's Go still offers a substantial world to explore, and a fun bunch of characters to interact with along the way, it's just that this time around there's not such a grind to push through just to get to the next location. 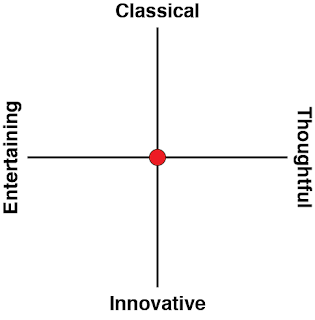 It has also been fun to see the various ways that the original Pokémon Blue has been adjusted to allow a modern smoothness of play, while still maintaining the core of what people have loved and in some cases (like mine) memorised to the finest degree. For example; the idea of having a "PC storage box" for your pokémon located in the specialised Pokémon Centres in each town meant that you needed to trek back to every time you want to change your combat party of six. It was a completely inefficient waste of time and, if anything, contradicted the appeal of Pokémon, which was in collecting large numbers of the critters. Now, in Pokémon: Let's Go, you can access your entire collection of pokémon, and swap them in and out at will, anywhere on your journey. It's a convenience that helps to keep the adventure pushing forward, and again, streamlines the way that the game uses its player's time. To further example of how Let's Go subtly re-works the original classics, because there's no longer those PCs lying around, the role of a particular character - Bill - is slightly different. You still need to visit him, and his scene in the story will be familiar, but it has been subtly changed by the mechanical elements of the game in a way that highlights the great eye for detail and nuance that the developers at Game Freak have approached Pokémon: Let's Go with. It would have been so easy to simply bring the original world of Pokémon Blue into the 3D, HD era, and fans would have lapped that up in droves. Especially with the Poké Ball gimmick controller. But Game Freak wanted to completely improve the experience, from top down, and yet still tap into the nostalgia of fans. It's not easy to juggle those different demands, and yet it's a masterful tightrope balancing act that has been pulled off here. Speaking of that Poké Ball gimmick controller, while it is utterly unnecessary to play Pokémon: Let's Go (aside from the bonus held within it), I couldn't help but love every second that I spent playing with it. It's a completely impractical controller for any other game but Pokémon... and even then it can be harder to turn to face an item to pick up or NPC to talk to than using a standard controller, but after 20 odd years of playing Pokémon, it's nothing short of wish fulfilment to be actually holding a Poké Ball while battling monsters and running around the world of pokémon. 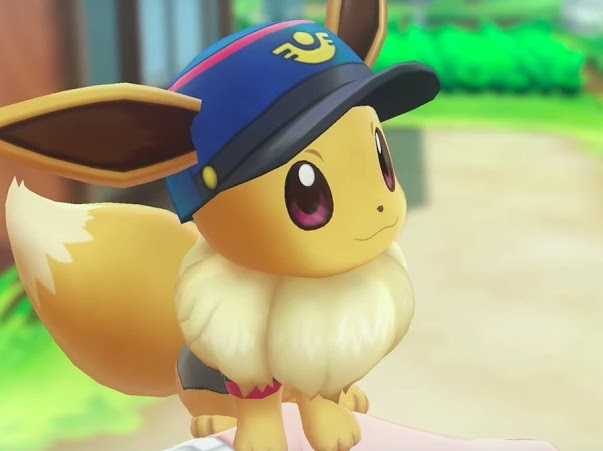 Nintendo and Game Freak have managed something quite special with Pokémon: Let's Go. It's a game that is so clean and streamlined that it is a near-perfect entry-level Pokémon experience for people new to the series. At the same time, it so perfectly taps into nostalgia that the oldest of old fans - people who really should have moved on, but can't because Pokémon is so damn charming - can find new ways to appreciate their hobby all over again. Yes, I don't like the monster catching minigame, for the same reasons I deleted Pokémon Go off my smartphone about a month after it launched. But that has nowhere near the impact on this wonderful, delightful, charming and happy game that I thought it would at first.